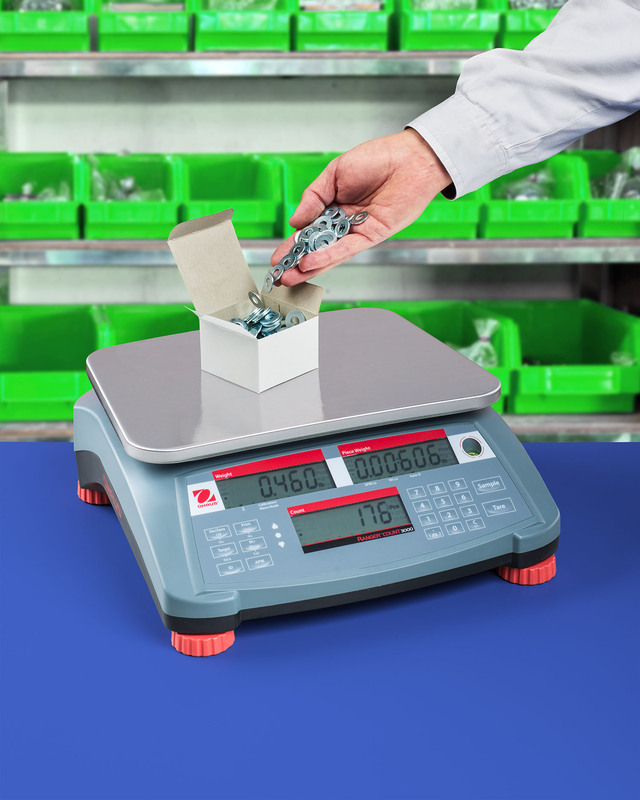 An easy to use counting scale that features advanced software for counting and packaging parts and offers a 30 item library data storage function has been introduced by Alliance Scale, Inc. of Canton, Massachusetts. The Alliance Ohaus® Ranger® Count 3000 Series counting scale is easy to operate using eight function keys, including sample and tare keys, and a full numeric keypad with three backlit LED displays. Featuring APW low alert and auto-optimization software that reduces errors and ensures accuracy, it offers a 30 item library that can store 12-digit part numbers, average piece weights or counts, and other parameters with quick retrieval. Producing accurate results within one second, the Alliance/Ohaus® Ranger® Count 3000 Series counting scale provides rapid stabilization and 1:30,000 display resolution and 1:1.5 million internal counting resolution. Capable of supporting two-scale counting through an optional second platform, this scale includes a standard RS232 port and can be equipped with an optional second RS232 port, Ethernet, USB port, and a printer. The Alliance/Ohaus® Ranger® Count 3000 Series counting scale is priced from $519.00 (list)., depending upon capacity.